A student was met with applause and a standing ovation when he came out as gay during an assembly at an elite Catholic school in Australia. 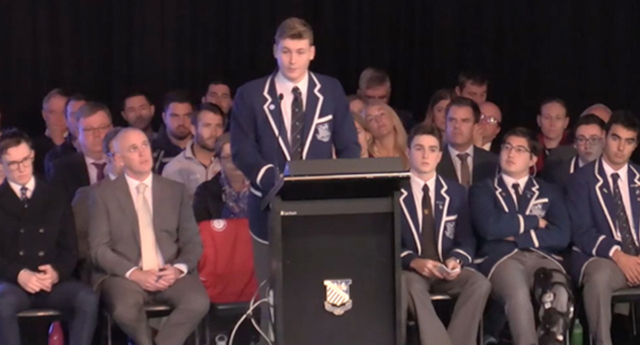 Finn Stannard, 17, publicly revealed he is gay in front of around 1,500 other students during the assembly at St. Ignatius’ College in Sydney. The footage of the moment, taken in June, was published by SBS News on Monday (November 26). He discussed his own struggles with his sexuality and came out publicly as gay to the room of his fellow classmates. “Life was easier living as the straight eldest son,” Stannard said in the video. St. Ignatius’ College counts a number of prominent individuals among its ex-students, including former prime minister Tony Abbott, who opposed equal marriage in Australia. Stannard posted about the moment on Facebook on Monday (November 26). “I had the privilege and support of my school, my teachers, my friends and family to proudly stand before my peers and tell my story,” he wrote. The student even took his boyfriend to the school formal. In the video, Stannard said his family has been supportive of him ever since he came out as gay. However, Stannard added that he has been taunted for his sexuality. “While my family handled the news of my sexual identity perfectly, outside of home, being gay has not always been easy. I have been the subject of countless rumours and unpleasant jokes,” he said. Paul Hines, principal at St. Ignatius’ College, said Stannard’s speech was a “watershed” moment. “I’m not sure anyone chooses their sexuality, that’s who they are and therefore we need to be open to that and to accept it and to make sure we live in communities of inclusion—and with that will come diversity,” Hines told SBS News.